It has been belatedly revealed that actor Jung Yunho fainted during a shooting. On the 12th, Jung Yunho’s facial muscles contracted during the shooting and he was rushed to the hospital. The official also said that Jung Yunho, despite being told to rest up after treatment at the hospital, returned to shooting the drama on the 13th. The official went on to say that on top of the weeks of all-night shootings and the stress of the lead role, the controversy of his acting and the mental stress weighed down on Jung Yunho’s state/condition. On the other hand, BongGoon (Jung Yunho) and SeungWoo’s (Lee SangYoon) conflict in ‘Heading To The Ground’ is making things interesting. Honestly, I planned to skip posting updates for today since I was really tired from work. I arrived here at home already past 9:30pm and I was really drained and sleepy. But when I saw this article translation, I just felt like I need to post it here for all of you guys to read. I think this is one important detail that DBSK fans shouldn’t miss. So now it is clear. JaeJoong, Yoochun and Junsu do not only want their contracts REVISED but instead they really want to TERMINATE THEIR CONTRACTS AND LEAVE SM ENTERTAINMENT for good. Reading this news really left me bittersweet feelings. I’m happy because I also want them to leave SM since the working condition in that company isn’t really good. I think they’ll be better of with another company which will treat them as PERSONS and not mere money-making machines and which will let them grow and do what they love most. On the other hand, I feel sad knowing that if the three of them leave SM, Yunho and Changmin will be left behind and, if SM refuses to let them work together under different companies, we might not see them perform as DBSK for some time until Yunho and Changmin decides to leave SM, too. I’m not being pessimistic and I’m definitely not losing my faith on our boys but I’m only accepting the possibilities of a complicated future for the group once the results are out. We have to face the reality that things wouldn’t be the same again after this. I never doubt the boys when they said that they will not disband and that they will stay together as five forever. Yunho said it himself during the Shanghai concert that they will NEVER part and I believe him with all my heart. But as long as any one of them stays with SM while the others leave, doing activities as a group will be hard. I was crying after I read this news article. I was crying not because I was losing my faith in DBSK but because I finally realize why all of them shed tears during the Shanghai concert. 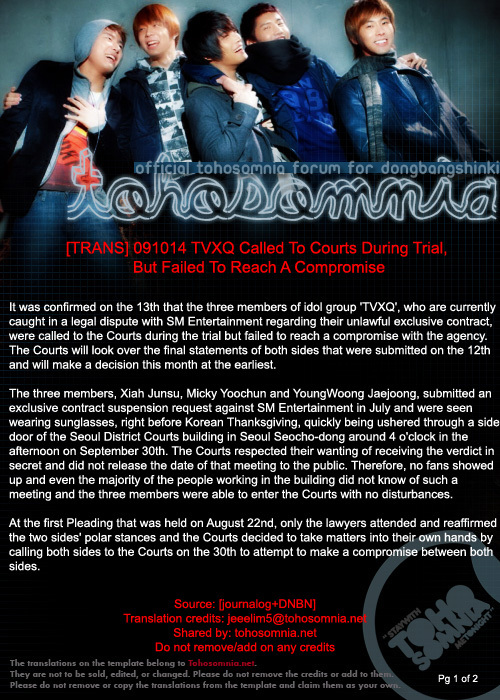 This whole meeting with the court happened last September 30th, which was just days before the Shanghai concert. I honestly think that they cried partly because they were touched by the fans’ chanting of “Miduhyo” and partly because they are already aware of the possibilities of the future after this whole scenario is over. The results is up to the Courts now but whatever the result may be, it will still affect us and the boys so much. All I can say now is that no matter what happens, I will support them. There may be complications after this and we might not see them perform together as often as we used to (if SM will not cooperate) but I will wait patiently until the time where everything will be back to what it used to be – the time where the boys are performing happily in front of us. I’m willing to wait and endure not watching them together for SOME TIME if it means that they will have a better life and gain that genuine happiness in performing in front of us again. I will patiently wait because I know that they will comeback in their best shape and they will give us better performances.